Definition at line 14 of file heatmap_max_keypoint_op.h. Mask R-CNN uses bicubic upscaling before taking the maximum of the heat map for keypoints. We would like to avoid bicubic upscaling, because it is computationally expensive. This approach uses the Taylor expansion up to the quadratic terms on approximation of the heatmap function. 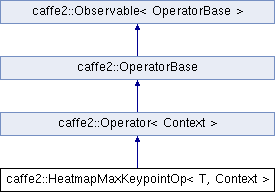 Definition at line 25 of file heatmap_max_keypoint_op.cc.